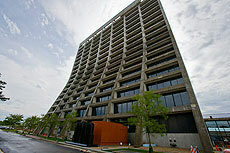 Construction of the Dark Energy Camera is taking place at Fermilab. Deep in the heart of the Illinois prairie, scientists at Fermilab are constructing a giant camera that will take snapshots of the night sky. The Dark Energy Camera, an extremely sensitive 570-megapixel digital camera, will survey a large area of the southern sky out to vast distances in order to provide new clues as to why the expansion of the universe is accelerating. Once completed, the Dark Enery Survey collaboration will mount the camera on the Blanco 4-meter telescope at Cerro Tololo Inter-American Observatory high in the Chilean Andes. 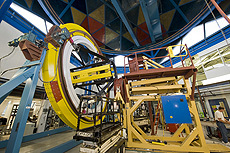 DECam will begin operating in 2011. Listen to an audio broadcast about the Dark Energy Camera and its construction by Andrea Mustain. Due to the steady decline in both frequency and severity of influenza-like illness across the laboratory throughout 2010, WDRS has removed the Temporary Changes to Sick Leave (Influenza-Like Illness) policy from the Fermilab personnel policies. The standard sick leave policy is in effect immediately. If you need to request leave to care for a family member, please contact the Benefits Department to review your options for FMLA leave. If you have questions about influenza-like illness, please contact the Medical Office at x3232. Please note that the U.S. Food and Drug Administration recently announced that it has approved vaccines for the 2010-2011 influenza season in the United States. The seasonal influenza vaccine protects against three strains of influenza, including the 2009 H1N1 influenza virus, which caused the 2009 pandemic. Watch for information from the Medical Office in early fall about the availability of seasonal influenza vaccination for Fermilab employees. The Senate Commerce, Science and Transportation Committee has passed its version of the America COMPETES Reauthorization Act. At a low-key executive session on July 22, the committee considered this bill, S. 3605, along with two bills related to offshore oil drilling and another bill on the reallocation of radio spectrum. Fermilab used Recovery Act funds to make improvements to the outdoor, ground floor entrance area of the west side of Wilson Hall. Construction workers have entered the final phase of the Wilson Hall generator installation project. By late September, Fermilab will use about $160,000 in funding from the American Recovery and Reinvestment Act to complete safety upgrades and landscaping on the west side of the high-rise. Workers from Don Bohr and Sons Inc., a subcontractor for Pandecon Inc., have widened the entrance to the Medical Office to 9 feet so that they can install a double door. “This will help emergency personnel better access the medical area if they have to get somebody out,” said Jim Niehoff of Fermilab’s Facilities Engineering Services Section. The construction crew recently renovated the sidewalks approaching the medical entrance and lowered the curbs to allow emergency vehicles to park closer to the doors. The crew eventually will create a 50-by-20-foot walkway paved with red concrete between Wilson Hall and the Linac. The colored pavement area will caution vehicles to reduce speed where pedestrians cross, Niehoff said. Last month workers planted new grass and six honey locust trees near the entrance. In August they will install a bike rack in a newly paved area that will accommodate parking for 16 bicycles and five motorcycles. Crews also will add new benches and redo the exterior lighting. Chez Leon, Fermilab's on-site gourmet restaurant, would like to hear from you, even if you've never eaten at the restaurant. Please complete the online Chez Leon survey to provide valuable feedback, including meal selections, days, times and other options. The names of those who take the survey will be entered into a drawing for a complimentary lunch for two.